The best beaches are the ones where there are flat logs for sketchers to sit on. Don’t you agree? If you find the perfect one you can rest all your gear on it and the sand doesn’t get on your palette. 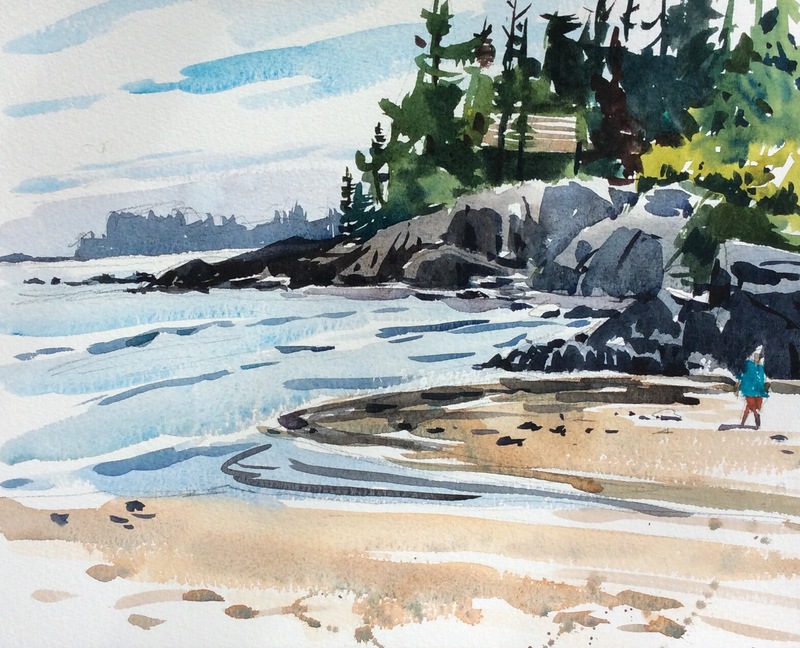 I’ve only just arrived in Tofino, after a long and at times very twisty ride across Vancouver Island, but I had to get down to Middle Beach to do a quick sketch, feel the ocean breeze, and look up at the tall, tall trees. I’ve been waiting a long time to say I’ve seen both coasts of Canada! I’m there !! Feeling it, smelling it, breathing it . Love how you captured all of this so simply & looks quickly. Now I’d like to get to the east coast of Canada and paint. I enjoyed some of the western Canadian coast only too briefly. You’ve really earned this trip – keep on enjoying. Thanks as always for sharing. Oh Yes! and you’ve done a lovely sketch too. But don’t you agree a little sand to nestle your water in so it can’t get blown over is nice too? How wonderful to have sketched on both coasts! Your depiction of the Pacific side imparts the feeling of being there. At my age, it’s 99.9% unlikely I’ll see the West coast in this lifetime. But, I’m so grateful to be only a 5 minute walk to the Fundy shores here in NB. And, yes, those mighty tides wash in some handy “outdoor studio” furniture and other interesting props! Wishing you safe travel home! Tofino is my favorite beautiful area out of many beautiful spots in Canada, even outshines tourist attraction sites in the States where I live. The small village is entirely unassuming and natural with no box stores; just lovely views of surrounding islands loaded with native flora and first nations; water and fishery activities; float planes arriving from and returning to the States. Thanks for your sketch to remind me of my April 2017 visit to this jewel on Vancouver Is. Great painting of a supernatural coast. Maybe some day, you might have the chance to paint our third coastline too! Oh Shari, Tofino is my favourite place in the world! It’s so special, I can’t wait to see the rest of your art from this trip. This looks like such a great spot…but I think you can make any spot look good. Love it!